This rotisserie chicken salad recipe takes five minutes to make and stays in the fridge for 3-4 days. Sometimes, I even use those rotisserie chickens you can pick up pre-cooked at the grocery store. I specifically remember one day during a joint-family vacation to the beach, I was preparing a meal for close to 15 people while trying to keep all my kids out of trouble in a house which was not baby-proof. That was a quick rotisserie chicken salad night. Who doesn’t like sandwiches on the beach? This recipe uses dill relish…don’t skimp on the pickles. If you’re a sweet pickle fan (eww), go that route; I’m sure it’s just as tasty. I like dark meat so the rotisserie chickens please everyone because my kids like white meat. 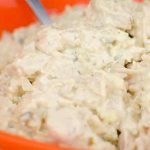 I typically use my chicken salad more as a dip for crackers with green olives on top, but it goes well on a bun or bread as well with extra mustard and some cheese. I must confess, I even eat it out of a bowl a spoon. We all have our vices. It takes five minutes to make and stays in the fridge for 3-4 days. Save yourself time on busy nights and pick up a cooked rotisserie chicken at the supermarket. Pick the cooked rotisserie chicken off the bone. Combine all the ingredients into large bowl and mix. Alternatively, combine all the ingredients into a food processor and blend for a few seconds. Try adding additional pickle juice for a more intense flavor. I love the zing that raw, white or red onions give this dish, but if that is too intense for you, try using sweet yellow onions instead.